Hello, I'm a seasoned modder with few years of experience. I collected all the different variants of the 250 family and made all the possible and/or missing skins of the cars that raced in the WSC rounds (which I can release without .car files, if there's interest I can post some screens of them), but there was one nobody before me did and I thought about rectifing that by making my own as I got tired of waiting for someone else to start this project. It's a 250 GT LWB, the coupe version of the '57 California Spyder I saw around here somewhere. For reference, it's the car that won its class at Le Mans in 1959. Model from CSR Classics, it's just a rough export to test some stuff. It has already been smoothed and put ingame for testing purposes, however everything but the main body is temporary and will eventually be changed with parts borrowed from other cars. Shouldn't take long for a beta, but I don't mod for GTL/GTR2, so if you want to help out with anything but skins, let me know. Very good job, Zexer! I hope you can finish this car and share with us. Good luck. Cheers! Nice work Zexer! We have a few missing 250s... And Ferraris in general. Nice to see some progress in that. Thank you. Taking shape ingame with a test livery (to be fixed, this is a placeholder for testing purposes). I'll work more on it tomorrow, but for now this is as far as I got in a few hours work. Fixed the exterior and completed the interior using parts from the '57 California Spyder I saw released around here somewhere. It won't have a complicated genstring (xyz object > on/off, no need to overcomplicate things). License plate in the back will be paintable aswell via its own texture. Progress of the day: head/brake lights, cockpit, backfires, driver model, lens flares* and SRPL shaders*. Still the genstring to do, but that's for tomorrow. *Features exclusive to rF, can't be done for GTL/GTR2. No hope for GTL huh? The car yes, though not from me so someone else will have to do it. Lens flares are not supported by the GTL/GTR2 engine. SRPL shaders I'm not sure. If not, the cubemap I use is still good enough for a shader less version. Not so worried about the particulars. The car is really sweet though. If you want to paint some liveries, or If you want to convert it to GTL/GTR2, let me know and I'll send you the files. Livery still to be redone. Really hope someone decides to do this for GTL. Nice car! So now that you've teased me, are we gonna see that anytime soon? Sorry, not this year for sure. Started it, it's in game, but had some problems addapting the interior and the cockpit to the body, so let it go for a while and switched to the 250 LM. But it's on the to do list. : ( I mean : ) I'll wait. Thanks for all your hard work. 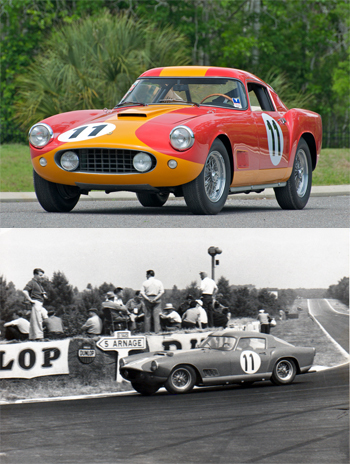 Sebring 1958, NART #22 (Chassis #0893GT) and #23 (Chassis #0773GT). In case anyone bothers. Finished painting all the liveries I had planned to do. That's pretty much it, all LWBs that raced in the WSC with the TdF body. There were some more, but they were not "TdF"s, so.. These are looking very nice, thanks Zexer. May I suggest though raising the graphical offset a little. The ride height looks a bit too low compared to the real cars in the first photos of this thread. Can I ask if this going to be released for rfactor? That would be fine by me. It looks low because of the angle of the pictures. The graphical offset and the physics are the same as the LWB California. And yes, but not for now. Subject: Re: The missing link in the 250 family.